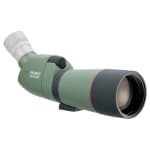 The TSN-660 series scopes are Kowa’s take on this standard medium-sized optic. Still compact at 12.3 inches long and weighing just 35 oz., the 66-mm objective lens of a TSN-660 scope has 21% more light-gathering capacity than a 60-mm objective scope. The TSN-660 scopes are fully multi-coated, completely waterproof and dry nitrogen-purged to be internally fog-proof. Like all Kowa scope series, TSN-660 scopes come in angled or straight configurations and are offered with standard glass or the PROMINAR version with the XD fluorite ion glass objective lens. 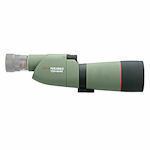 The Kowa TSN-660 scopes are fully digiscoping capable with Kowa’s adapters. All TSN-660 scopes are made with Kowa’s heavy metal-free Eco-Glass process.